I have seen many people with folders full of information about their family history. They have put years of research into what they have done, but sharing it with their family is the challenge. The thrill of the chase and looking for the next piece of the puzzle gets us pushing all that hard work to the side. But the reality is, if anything happens all that research may go to waste. I know we always are waiting for the next piece of information to make our family history complete but we all know it is never “complete”. You have put so much hard work into the research, don’t let it go to waste. Seize the day and know that you are creating something truly valuable for your family. Take it in small chunks – Writing your family history can seem like a daunting challenge but it is certainly possible. I break down my own writing of family histories into generations. This means that I would do my grandfather and his siblings in one chapter. Then my great grandfather and his siblings in the next chapter. For anyone helping you edit you work, this break down into smaller chapters will make it easier for them too. Add flavour to your words – instead of just stating the facts, add to the history by looking at what was happening in that era. If you are writing about your ancestor being a miner, look at what the conditions were like in those mines and add it in. You may find that diary entries were written in the war that talk about a battle or area that your ancestor fought in, add it to show what it may have been like. Visual Appeal – Add photographs, maps, examples of posters, memorabilia, historical pictures of places and people, newspaper articles. It can be hard to digest all the information that is in a family history. Breaking through this with visuals is essential in making it easier for your family to enjoy. Visual aids add another talking point and an opportunity to include them. It may even be an idea to start with a simple photobook for younger members of the family. Also make sure that you include detailed captions for your visuals, who people are, where the photo was taken, or where you obtained the visuals from. Timeline/ Pedigree Chart – start your family history with a timeline or pedigree chart or even a family group sheet so that they can be referred back to. As family members make their way through your family history, they will end up wanting to come back to those reference pages. Narrative – to really get your family’s attention, pick a story or particular time in your family’s history that you can make into a story. I have an example of one of our original ancestors on the website. Your narrative doesn’t have to go for to long, even a paragraph or so to introduce a person would be interesting. Memoirs/ Personal Narrative – when handing on your family history, you may be doing it to let them know more about you. You can add anything from a simple timeline of your life events, to a detailed memoir of your life. My husband’s grandmother wrote her memoirs and I love them. She didn’t write stories, she just wrote exactly what she would have said. I feel like I can hear her voice when I read through them. You don’t need to be a writer, just writing whatever impacted on you. Length – It may be wonderful to have a novel sized book of your family history but unless it’s riveting it may not get read. There’s no ideal size but I would keep it manageable, you may need to mail it or keep a copy on you. It also will get quite expensive to print too. So make sure that you cover all that you want, but don’t go overboard. The part where I compile all my research into a family history and give it to my family makes me proud of all the hard work that I have put in. I get such a feeling of satisfaction to send it off. However I find that the best thing about it is the fact that my family starts talking about it and asking me more about the family history. It becomes something that I can share. I hope you get the chance to share your family history. Last updated by Nicol Warren at October 13, 2015 . 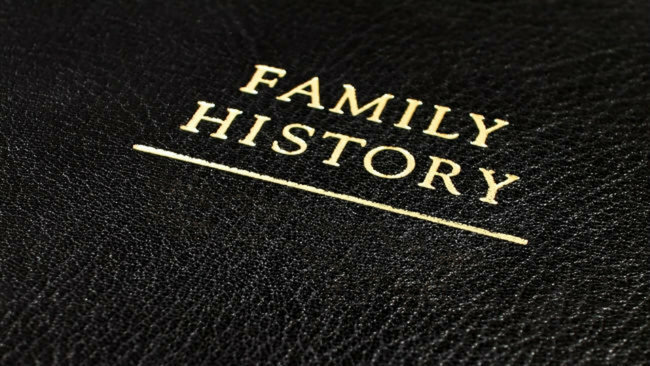 Family History book, Getting started in family history writing, Writing family history. Bookmark.